AFAM Motocross chains withstand extreme use because the components are specially treated to wear as little as possible. Sand and mud are indeed not ideal conditions for a chain, and yet you want to win the cross. For precisely these extreme conditions, AFAM has developed the specially treated motocross chains! AFAM 420MX2-G / 428MX-G Motocross chain for 85 cc. Gold color with parts of a superior quality. The pins are chrome-plated in order to reduce wear. AFAM 520MR1-G motocross chain is perfect for amateur and more experienced riders. The parts subject to wear are greatly improved. The quality of the chrome-plated pins, bushings and rollers reduce wear and increase longevity. 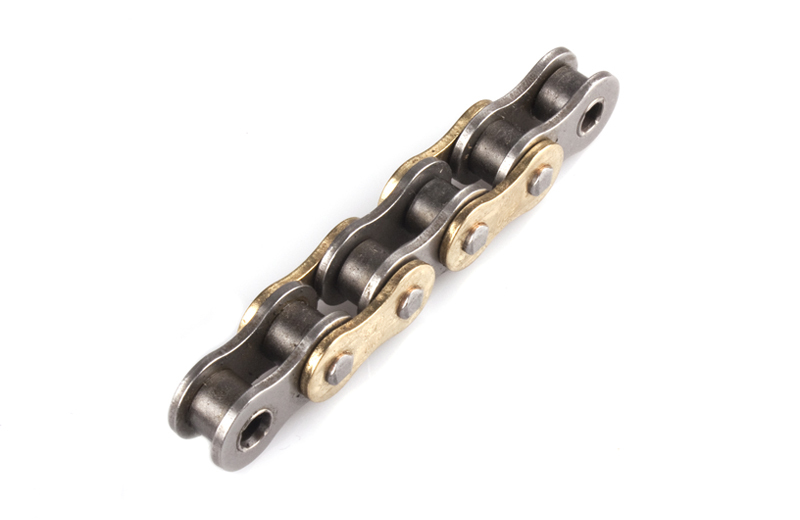 AFAM 520MX4-G is a gold superior motocross chain for professional use. This chain uses advanced techniques from MX1. The quality of the components and the precision is truly top so that wear is limited and you obtain a maximum lifespan. This chain is also available in red, blue and orange color.